A checking account offers members a multitude of benefits in terms of convenience and safety. At People’s Community Credit Union, we believe a checking account is essential to your financial stability, which is why we’re proud to offer our Loyalty Checking account. Loyalty Checking is designed to meet your checking needs with no monthly fee, all the while earning a high dividend rate on balances up to $35,000. Learn more about Loyalty Checking accounts below. Checking accounts are a smart choice for two main reasons: superb convenience and reliable safety features. This versatile account allows members to manage their own expenses, income, and budgets. Our Loyalty Checking account makes it easy and economical to meet your day-to-day financial needs. Why Open a Loyalty Checking Account With Us? When you open a Loyalty Checking account with us, you are making a smart step toward bettering your financial health. After meeting certain requirements*, you can earn 2.50% APY on your Loyalty Checking account as well as refunds on all domestic ATM surcharges (up to $100 per month), and there is no minimum balance requirement or monthly fee! *Loyalty Checking account holders are required to be enrolled to receive statements electronically, complete 10 or more debit transactions monthly (not including ATM transactions), deposit at least $350.00 into Loyalty Checking account monthly, and complete at least three Online Banking or Bill Pay transactions monthly. All requirements must be met with transactions posted and cleared by the close of business on the last day of the month. If you do not meet all the applicable requirements, your Loyalty Checking account will earn the Annual Percentage Yield applicable to regular savings accounts. 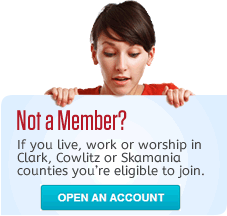 We are proud to serve all our members and believe in our member-focused philosophy. When you open a Loyalty Checking account with us, you can rest assured you will be taken care of, as we strive to provide our members with only the best and friendliest financial services. To open your account today, visit one of the People’s Community branches or use our online service!